You know? Sometimes we like to eat roast pork (烧肉), so we will pack some meat from the store as dinner over lunch time. We have to leave the packed meat in the office till the night, and hence, we will normally forgo the nice chili as it will go bad if waited till the night. But, by eating just the roast pork without nice chili to go with, the taste of such scrumptious roast meat goes less appealing, I personally think so (smilling). 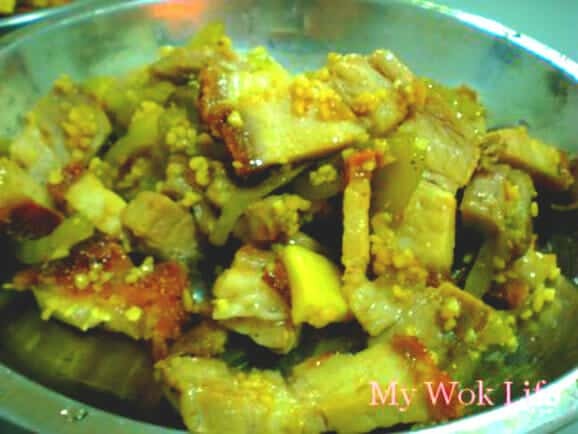 What I normally do with the roast pork if I were to cook them for dinner is to fry the roast meat with salted vegetables, and some condiments to add more flavour to the whole dish, even without nice chili. This roast meat dish is indeed flavoursome. It is one of the best dish to complement your plain porridge or hot steamed rice. Just one bowl of porridge/ rice would never be enough, with this best flavoursome meat and vegetables dish! This is a simple, and express dish to cook on the weekdays. It needs simply 10 minutes to get the dish up. 1) Heat wok with oil over high fire. Add minced garlic and ginger slices, stir-fry till fragrant. 2) Reduce heat to medium fire. Add roast meat and leave it on the wok to crisp slightly. Stir occasionally. Then, add salted vegetables, stir-fry for 1 minute. Sprinkle some water to keep ingredients moistened. 3) Add sugar, and stir-fry for 1 minutes. Then, add oyster sauce, and continue frying for another minute before adding some rice wine. Stir-fry for one minute to combine well. Sad to say, this roast meat dish is not ideal for diet-watcher (sobbing). It counts more than 500kcal for a portion of it. Tips: Since the roast meat is salted. It is best to steep the salted vegetables to almost bland. Try steeping it for 1 hour beforehand, if you have the time. * To create crispness of the roast meat, first add only the roast meat, and reduce heat to extremely low fire. Keep the fire on, and remain the roast meat as it is in the wok, until roast meat is cooked to a crisp. Then, add salted vegetables and resume the remaining steps as stated.